"Do We Need Private Channels in Microsoft Teams?" Do private channels in Microsoft Teams go against the product's otherwise simple/flat collaboration model? 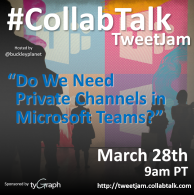 Always include the #CollabTalk hashtag in your responses. This allows us to track everything as a conversation, tracking the level of engagement and measuring sentiment analysis. Side conversations, direct messages, and additional questions are all welcome! Some level of self-promotion (links to your company, articles, content, etc) are fine, but don't go overboard. The purpose of these tweetjams is to share ideas and experiences, and to network. You do not need to be on the panel to participate -- everyone is welcome, so join the community conversation! Sponsor one of our monthly tweetjams and reach more than 250,000 social profiles within a single hour event. It can help your company build brand awareness, demonstrate expertise and thought-leadership, and to network with leading experts.